The University of California San Diego and the Foundation for Biomedical Research and Innovation at Kobe (FBRI) have entered into a five-year memo of understanding (MOU). 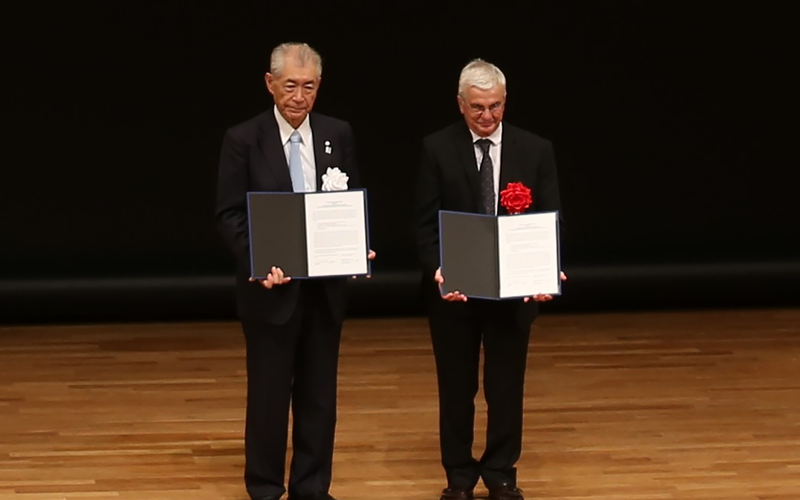 The MOU was announced on October 19, 2018 in Japan at the 20th anniversary celebration of the Kobe Biomedical Innovation Cluster, of which FBRI is the core research institute. FBRI was established in March 2000 through funding from Kobe City and Hyogo Prefecture. They are charged with promoting and facilitating collaboration and integration among industrial, governmental, academic and medical sectors; supporting R&D leading to advances in healthcare and their clinical applications; and working toward the construction of next-generation healthcare systems. FBRI’s ultimate goals are to revitalize Kobe’s economy, enhance local residents’ wellbeing, and contribute to the international community. For several years, UC San Diego has worked cooperatively with FBRI and the City of Kobe. In 2016, Dr. Honjo received the Kyoto Prize in Basic Sciences, and subsequently spoke at UC San Diego as part of the Kyoto Prize Symposium. Many UC San Diego faculty have also spoken in Kobe at the request of FBRI including most recently Distinguished Professor of Pathology Napoleone Ferrera, who was present at the 20th anniversary celebration. In turn UC San Diego has hosted the Kobe BIO International Delegation, led by members of FBRI.